What Are The Different Types Of Chiminea Fireplaces? You are here: Home / Blog / What Are The Different Types Of Chiminea Fireplaces? For those of you who are not aware of what chiminea fireplaces are, they are simply a front loading fireplace or also known as an oven that has a vertical chimney. They are a very simple outdoor fireplace that you can use to stay warm in the evening. The body of them is bulbous and they have been around for hundreds of years. They have become a popular item and have been used as backyard fireplaces by many people. They are often times found in gardens as well and are used for yard décor. 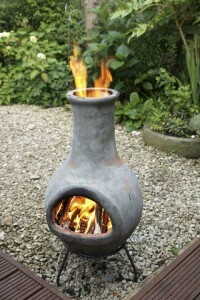 There are several different types of chimineas, and here is a little more about them and how they are used. Terracotta is the original design for chimineas. They are more delicate than the cast iron material, and if you aren’t careful at how you start your fire, the chiminea can crack and break. However, if done properly, you can have a long lasting fire that will be warm and comforting when sitting by it. These are great earthy additions to any themed backyard or garden as well no matter what you plan on using them for. 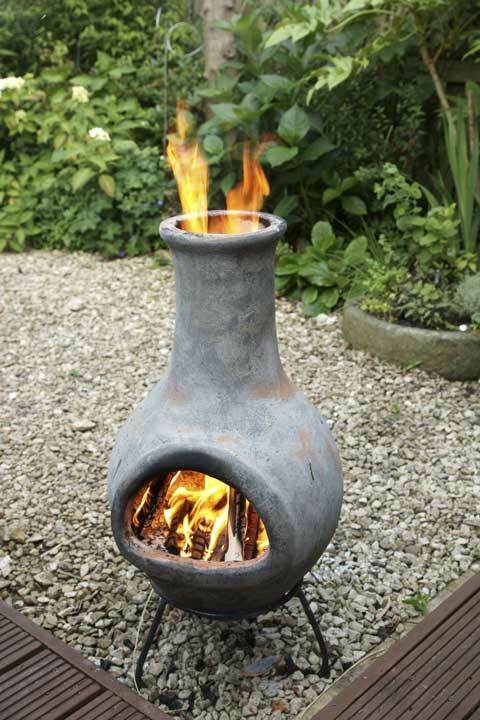 There are several variations to a chiminea, and one of the more common ones is a ceramic chiminea. These are great for outdoor decoration and can take any bland yard to glamorous. If you are entertaining guests, these can help keep the outside sitting areas warm and comfortable. These are great for withstanding extreme temperatures and with proper maintenance, can last for several years. You should never use a liquid that is flammable as this can actually crack the chiminea. You should use newspapers to get a fire going and kindling which is the better option. Your outdoor fireplace can burn different types of woods such as oak, and can withstand the varying temperatures. A chiminea that is constructed with cast iron is both low maintenance and far better than one designed from clay or other products. A cast iron design is a little more intricate and offers a variety to choose from to take your backyard experience to the next level. You can find them in a few different sizes and features like a door on the front or a grill. What Can Be Burned In Chiminea Fireplaces? Chimineas are designed to burn wood. Your best option is to use hard woods as they are the best for burning and they often lead to fewer sparks. If you plan on using your chiminea to cook, your best option is to choose charcoal. The most important thing to remember is that no matter the design or type of outdoor fireplace you have you should never use lighter fluid, gasoline, or other flammable liquids. This can lead to dangerous explosions as your chiminea will heat up too fast. You should begin with hard woods to better create wood coals which are going to help light your charcoal. There is also self lighting coal that you can choose as well. Additionally, if you are thinking of how to stop the fire or put it out, never ever use water as this is going to cause temperature shock as well as steam and can result in the breaking of your chiminea. If you are in need to stop the fire in a rush, consider throwing sand on it o even using a fire extinguisher. Don’t use a CO2 extinguisher, rather one that has a dry chemical in it. You should receive an instruction manual with your fireplace which should outline all the care and safety concerns that you have.